Let’s face it, we don’t like haggling. 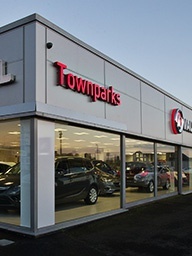 Available on Corsa 3 door and 5 door please visit Townparks Vauxhall for more information. The New Corsa Griffin's are a genuine Limited Edition so don't leave it late - contact our Sales Team and book a Test Drive today - you could be driving a bargain tomorrow! The New Corsa Griffin - packed with extras from only £195 per month* - Call our Sales Team and book a Test Drive Today!